You will need to download the Payment Gateway Swipe software for the terminal BEFORE you plug it in. Once you have downloaded the software you can plug in the terminal. You will need your Virtual Terminal login username and password for the initial set up and possibly for each time the computer is rebooted. Note: If required, additional Users can be set up in the Virtual Terminal; contact your payment partner for instructions. The terminal will come with a coiled USB cable that can extend approximately 3 feet. If you need a longer cable you can order one that is 6 feet or longer. 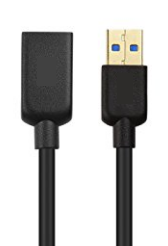 What you are looking for is a SuperSpeed USB 3.0 Type A male to female extension cable.